Miscellanous » Are Your Almonds Truly Raw? Are Your Almonds Truly Raw? This may or may not come as a surprise, but if you’re buying raw almonds grown in the United States, they’re not actually raw. It has been brought to my attention that some people still aren’t aware of this fact, so I thought it might be a good idea to revisit the topic today. Had I not been a raw food enthusiast at the time, this news would have probably slid right under my radar. As I recall, there wasn’t much media coverage, and I only found out about it through a raw food forum, full of outraged consumers worried about the impending ban. In a panic, I drove to the nearest Trader Joe’s and bought as many jars of truly raw almond butter as I could possibly store in my pantry. I was stocked up for at least 6 months. 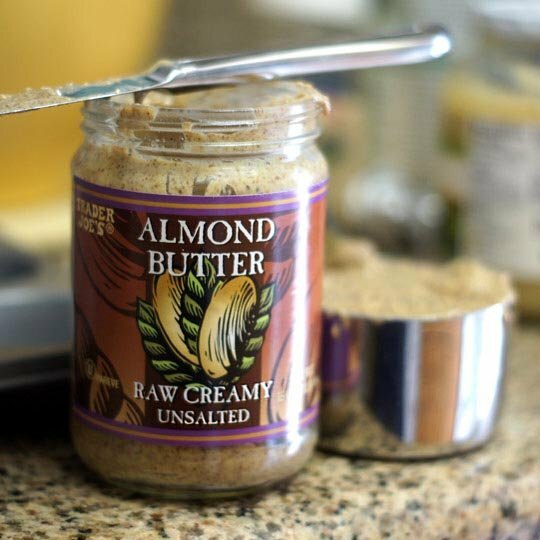 When my supply had finally run out, I was surprised to find that even after the ban had passed, raw almonds and raw almond butter were still plentifully available on store shelves. Only, it didn’t taste the same as the raw almond butter I stocked up on before the ban was passed. That’s when I learned that even pasteurized almonds could be labeled as “raw.” In fact, they can be steamed, irradiated, or treated with chemicals, and still be labeled as raw! Bremner Farms sells unpasteurized raw organic almonds directly from their farm, starting with 5 lb boxes going up to 30 lb boxes. Amazon also sells truly raw almonds, like this 2 lb bag from Sunfood. Blue Mountain Organics sells truly raw Italian almonds, starting with bags as small as 8 oz. and up to 25 lbs. One Lucky Duck also sells unpasteurized raw organic almonds. 2) You can also buy almonds that were grown outside of the USA. I’ve noticed that my local Whole Foods has started carrying truly raw Italian almonds near the bulk section. Check your local grocery store, or talk to the store manager to request that they start carrying them! Note: If you do choose to buy raw almonds grown in the USA, I’d recommend sticking to organic varieties, to avoid the chemical pasteurization process. These pasteurized “raw” almonds tend to be cheaper than the truly raw varieties, and if you plan using them in grain-free baked goods, they don’t need to be raw anyway! However, avoiding chemicals is always a good thing, if you ask me. Reader Feedback: Were you aware of the raw almond pasteurization in the United States? If so, do you make an effort to buy truly raw almonds? I bought raw almonds from Whole Foods this week and they were mushy and tasted like they had almond flavouring added to them. Really gross. Previous almonds I bought there were just fine. I will try the organic next time. This is informative, thank you! Crazy… we will be buying our almonds imported or from the local farmers’ market from now on! Can steam pasturized Almonds be sprouted? Is the enzyme still intact? It really pisses me off that farmers are screwing people by charging TWICE as much (OR MORE) for unpasteurized almonds when removing the extra step of pasteurizing actually reduces production costs!! Thank you for consistently and constantly taking the time to think holistically about the world we live in and how we are all connected with the earth through science. My question is actually about “One Lucky Duck” . . . I tried to search online for it, but it looks like it was a brick-n-mortar that closed down? Is it near where you live? Did it move or get reopened? Just wondering if the company has a new name or something! Ever since I made those Date Energy Balls, I knew I had to Subscribe. Thanks for the constant ideas and knowledge. It’s made me a fantastic raw vegan paleo cook. 😀 BTW, I’m at the point right now that sprouted nuts are SO delicious that I can’t even make them last long enough to cook with them. HA! Except for Cashew crusted cod filet…… but that’s it! so what about almonds in the shell? I appreciate how hard you and Annemarie work to share information about this topic. I’d rather have almonds that were pasteurized than sprayed with chemicals. They should stop lying about being raw and tell you which treatment they received. How can the guy advertise his own “real” raw almonds as raw when the others are lying in their advertising? I think Nonpareil almonds are not bitter at all and are even a little sweet. I also grow Monterey variety and they may be a tad less sweet, they are not bitter either. I am an almond grower and directly sell my organic certified unpasteurized almonds to the consumer. I am willing to sell you any variety (I have 3) and any quantity under 100lbs. I can also provide different varieties I grow, separated so you can discover the variety you like the best. Check out our farm at http://www.chorganicalmonds.com and see and read for yourself how we grow your healthy food the way it should be done. Thank you Mr. Paddock. Your web site is nicely done and had great information on your farming practices. I just ordered a 5 pound bag. Thank you for the care you put into your farm. I have a Natural Grocers near by, and they sell a Organic Spanish Raw Almond. Being from Spain I assume it really is raw, but I have not been able to comform that. Plus they have a dust on them that I don’t enjoy while eating them (what is that from?). Is there any variety of almonds that does not have any bitter almonds at all? Wow, this webpage is like shill-central. The reason they do not want us to consume the almonds raw, is because those are too healthy. Humans consumed them for kabillions of years before the almighty science came around and created the issues we see with bacteria today. They did not die, they did not get sick. Factory farming of ANY food, will introduce bacteria. If the raw almonds did not provide such a high content of B17, then we would not be having this discussion. Nor would the shills be commenting. This blog is awesome, and this piece is wonderfully written! Thank you for spreading information instead of lies. It is refreshing to see these days! Now y’all go drink some raw milk and eat an apple seed with cyanide… and NOT die! You, you’re the one I want to talk to. Thank you for being a wonderfully truthful and insightful person. Where do you buy your almonds? I want what you’re having. I was just recently informed of this issue, and I’d like to know whether almonds still in their shells are pasteurized as well? If so, do any US almond producers sell almonds in the shell (because it’s technically illegal now to sell them unpasteurized if grown in the US). Thanks! You can’t beat the quality and price of Food To Live Organic Almonds. They also offer free shipping. Just realize, the almonds from https://foodtolive.com/shop/organic-almonds/ are imported from Spain. They are not California almonds. Furthermore most folks are interested in knowing how their food is grown, Food to live is NOT the farmer, they are a retailer. How are they harvested? On the ground? Who knows. Purchasing unpasteurized almonds directly from the farmer has and inherent benefit; knowledge on how it is grown and prepared for your table. This absolutely disgusts me that you would do absolutely no research yet implore people to find unpasteurized almonds. It’s frankly shocking that you were so oblivious that you did not consider why it is illegal to sell raw almonds. Listen up readers. RAW ALMONDS ARE POISONOUS. THEY CONTAIN CYANIDE. Don’t take my word for it though, talk to a doctor, read some studies, do your research. Don’t believe imbeciles like this blog that’s supposed to help you get RID of toxins, while suggesting you eat literal poison. You have been warned. And keep in mind that the USA did sell raw almonds up until 2007– so plenty of people were eating raw almonds and not dying. The concern was about two cases of salmonella contamination, not poison found in the almonds. Let’s be careful who we’re calling imbeciles here. If the USDA requires pasteurization, how should we naturally “clean” the almonds if we purchase raw, organic, unpasteurized almonds? Good question. Almonds are not clean due to how they are “normally” harvested. The USDA implemented pasteurization dues to the manner which almonds: onto the ground, then swept up with a dusty sweeper and pick-up machine. Past cases of Salmonella poisoning were attributed to this method. When the harvested almonds are harvested this way, even though they are in a semi-porous shell, they still get rubbed around among the many pathogens on the orchard floor. Hence USDA required pasteurization to prevent an economic crisis in the almond industry and State of California. Organic Pasteurization kills the live enzymes via heat. The solution I have implemented as an organic grower to provide unpasteurized almonds yet safe and clean is to harvest on tarps, not the ground! My almonds are not rubbed around on the ground and are not subjected to pathogens. So back to your question: If you buy from a farmer who does not harvest onto tarps and you want clean, safe unpasteurized almonds then you are out of luck; cant be cleaned. Otherwise buy from an organic farmer who harvests onto tarps, therefore the nuts are clean and there is no need to wash them. This is what my farm offers: Capay Hills Orchard. I sprout a lot of different kinds of seeds. Making sure all the seeds are uncontainated is always a concern. When soaking seeds I buy, I add a couple drops of GSE (grapefruit seed extract) to the water to kill off any unwanted organisms. WE are looking for raw almonds in the shell–for germinating and growing trees. This is a class project. Kindly advise if your almonds in the shell are suitable..? I can provide you my almonds. They are unpasteurized and will sprout tress when watered. Not sure how they will do in Thailand. They like a Mediterranean climate. If I want to make my own almond milk, recipes call for raw, blanched almonds. What does blanching do to almonds? I haven’t found organic, raw, blanched almonds from among your links to good almond sources. Any tips on how to know if almonds are fresh vs. rancid??? I keep second guessing my nose, but it’s probably right. Fresh is fresh, right? : ) I soaked some macadamia nuts last night, and this morning they had a slimy coating on them which caused me to sniff them. So hard for me to know for sure — and I’m suspicious of the slimy white coating, but it could be a macadamia nut thing. They came from the Whole Foods bulk bin, so could easily be rancid. Without tasting an almond or nut, there is really no definitive way to test for rancid nuts. Some folks consider placing them in water and the rancid ones float, but this is not true. Very fresh tasty almonds for example will float. some float, most sink. Depends on how much oil in the nut, density and the specific gravity of the water. The best suggestion I can do is ask your almond or nut supplier to tell you how they are stored. There is specific data on how to properly store almonds and for how long. Here is a link to a good document from UC Davis: http://homeorchard.ucdavis.edu/8005.pdf Best bet is buy you almonds/nuts direct from the farmer and have him/her tell you how they are stored. Now you know what their answer should be by looking at the UCD document. Brian Paddock, Organic Almond Grower, http://www.chorganicalmonds.com. i am trying to make my own almond milk, but am finding it difficult to find raw unpasteurized BLANCHED almonds. any suggestions where to find these jewels??? I think the blanching process would make them not technically “raw,” so that’s probably very hard to find! There’s no need to use blanched almonds for almond milk, though, since you strain out the pulp and skin after blending. That would only work if you don’t intend to make macaroons. Yes they are. If the farmer who grows them sell them to other than the consumer (a handler), then they must be pasteurized. Are bitter raw almonds available anymore or just the sweet variety? I understand there are ways to purchase raw unpasteurized almonds in the US, but are these almonds – whether imported or domestically grown – only sweet almonds? I know there is much controversy over the natural toxicity of bitter almonds, but from the research I have done, the presence of amygdalin, which is present in bitter but not sweet almonds, has dramatic effects on the treatment and prevention of cancer, and to reap the benefits of it one only needs to eat a few per day, nowhere near the amount needed for any naturally occurring poison to do harm. Nevertheless, from the posts it seems that the only kind of almonds sold – pasteurized or not – are of the sweet variety. Am I correct or are bitter almonds still available? Any help would be greatly appreciated! As far as I know, bitter almonds are only used to make things like almond extract so the poison they contain is removed during processing. I am under the impression that sweet almonds, which contain no poison, are the only ones available in grocery stores. You want apricot pits, for cancer treatment. You cant have it both ways people. Thanks to the growers at Paramount Foods (the guys that brought us POM Wonderful) there were 2 outbreaks of Salmonella in almonds. As a result of the failure to being able to ensure that the harvesting techniques, the growing, sorting and shelling of Almonds could eliminate Salmonella from the food stream, the USDA had to take the lead by banning the sale of RAW ALMONDS. Keep in mind that the USDA and FDA have a directive to prevent food outbreaks due to foodborne pathogens. If they didn’t take this step one could envision that some group would sue the regulatory agencies for not protecting them from Salmonella. On the other hand, how many people that profess to want to eat raw almonds turn around a sue the companies when the do get sick? Similarly, the same people that want raw milk are the first to pony up a lawyer once they come down with a debilitating illness directly related to their choice to drink a very unsafe product. Kind of like the smokers that sued the tobacco companies for their cancer because of THEIR choice to smoke. Cant have it both ways folks! It’s not the actual product that makes you sick, but how it’s handled. Raw milk is NOT, by any stretch of the imagination, an unsafe food. Now if you stick it in dirty bottles or something, then there’d be a problem, but it’s not the milk or nuts itself. what about UNshelled (still in the shell) almonds? are they pasteurized or treated with ppo? i wouldn’t mind sitting and cracking these open if i knew that they were truly raw and safe. does anyone know where i can get a couple pounds of the unshelled for a reasonable price? thanx! Is this true of all nuts or just almonds? As far as I know, this law just applies to almonds. I WAS SHOCKED WHEN I HEARD THEY WERE STEAMING AND USING PPO ON THE ALMONDS. WE EAT VERY HEALTHY FOOD. HOW CAN OUR OWN GOVERNMENT MAKE SUCH RULES TO DECEIT THE CONSUMERS. EVERYDAY I PUT SLICED ALMONDS, PECANS, CHOPPED WALNUTS, ORGANIC RAISINS AND CHOPPED BANANA. ITS HEAVENLY. I THOUGHT I WAS FEEDING MY HUSBAND AND KIDS HEALTHY FOOD. THIS IS SO VERY UPSETTING. I CANNOT BELIEVE I FED THEM CHEMICALS EVERY MORNING. Thank you for writing this article – quite informative! Are there similar laws for other types of nuts or is it just almonds? Yes, I am aware of this issue. When these laws went into effect, I had already been purchasing raw organic unpasteurized non-pareil almonds from a California family organic almond farm for some years. A great struggle then ensued, so consumers could continue to purchase the truly raw almonds we wanted. I contributed my input to get the laws changed or excepted because I wanted non-pasteurized almonds. I believe chemically or heat treated almonds are bad for the health of my family. I understand that heat treatment destroys valuable vitamins and enzymes and in addition that processing chemicals are poisonous. The reason this law was instituted was due to a very small incidence of salmonella in people who had eaten almonds in the US. There were as I recall only a total of appx. 3 people in the US who were affected, and they had eaten only commercially grown almonds. NONE of them had eaten organically grown almonds. This law threatened the existence of small organic family farms, since it can be expensive to institute processing procedures. In addition, it is generally against the philosophy of organic family farmers to use health-destroying measures like this, as they want to maintain the health value of organic foods. As I understand it, the result ultimately was that these family almond farms are legally able to sell unpasteurized, truly raw, almonds when the consumer purchases them directly from these family farms, although there may be some quantity limit. Thank you for bringing this important matter to more consumers. It is a travesty that almonds can be labeled “raw” when treated with heat or chemicals. Allowing processed almonds to be labeled “raw” misinforms consumers. I believe the consumer has a right to purchase food that is safe and healthy, and in order to do that, the consumer needs legally available food sources and accurate information, including the correct labeling of foods. I highly recommend that you and your web site viewers check out The Center for Food Safety at: http://www.centerforfoodsafety.org. I discovered this web site with gratitude. These folks support pending legislation (including accurate consumer labeling) to protect consumers, our food supply, our seed stock, and viability of our earth. Those who get on their action list will be informed of such pending legislation and will receive email links, so they can contact elected representatives to express their viewpoint. Together, we have a voice, and this is the time to get involved, as legislation is pending regarding Genetically Modified Foods. Learn more at http://www.centerforfoodsafety.org. Thank you for providing this information. I have been buying raw almonds – not organic from Trader Joe’s for years. I am concerned however for not exposing my family to salmonella poisoning. How can we avoid the chemicals and protect my family from bacteria? I am an organic almond farmer in northern CA. It is a valid question to balance eating an unpasteurized product vs a fumigated or cooked one and lose the health benefits. Understanding the background of the pasteurization law is important, it is the result of a threat mainly due to the method almonds are typically harvested, onto the orchard floor where there are plenty of pathogens. The law mandated pasteurization of CA almonds and eventually carved out an exemption that you CAN buy CA unpasteurized almonds directly from the farmer. But chances are that farmer harvests onto the orchard floor and there is a chance bacteria can migrate to the almond and your mouth. Part of my food safety plan is that we harvest onto tarps, not the ground, thus avoiding the pathogens. So YES, you can source CA raw almonds and get them in a safe manner. Yo learn more check out our website http://www.chorganicalmonds.com. I have nothing to hide and enjoy teaching people how I grow their food. The “pasteurization of almonds using PPO occurs between 34 and 40 degrees. This type of pasteurization does not rely on heat like with milk. 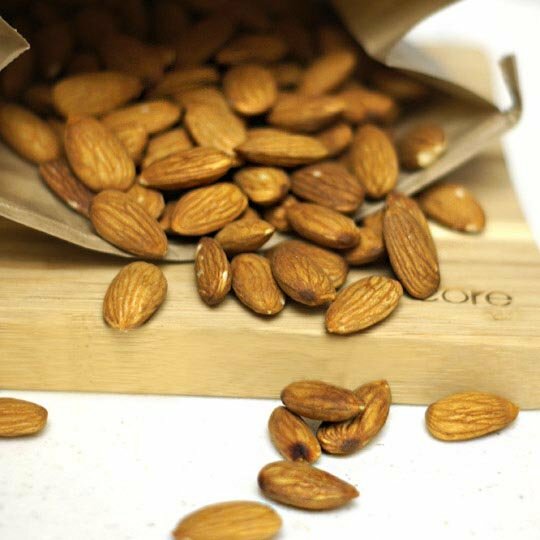 Since the average human body has a temperature around 38 degrees then holding the almonds in your hand will make them not raw. Only PPO vapor is used to pasteurize almonds. This means the liquid will not condense on the almonds and no PPO will be in or on the almonds. Do you worry about methane, propane or butane contaminating your food when you cook with it? Nasty is an emotional word, not a scientific term and does not explain anything. PPO is not mixed with fuel because the mixture is very flammable and difficult to safely handle and use safely for sporting events. The highest incidence of Salmonella contamination occur with “organically” grown foods and local markets. Love that Almond Butter! most Almond Butter costs 11-$25 now. Just go shop at Sprouts and see what I mean, or Whole Foods. ok, so i’ve learned a heap about almonds from this post just now. but my reason for stumbling onto it in the first place is because i want to make my own almond milk. i bought raw, excuse me, “raw” almonds, and soaked them for two days. they did not soak up much of the water and still remain hard and crunchy. i was under the impression that after two days, or even after one day, they would become somewhat squishy after absorbing the water. so, is it because my almonds are not “raw”?? what am i doing wrong here? seems like no one else has this issue..